Cell death plays pivotal roles in normal development, and homeostasis but, when either inappropriately implemented or blocked, contributes to severe pathological conditions. Two commonly occurring patterns of cell death have been described: apoptosis and necrosis. Apoptotic death generally occurs as part of normal development and in cell depletion due to a broad range of stimuli, usually mild in nature. The second pattern of cell death, necrosis, occurs in response to extreme changes of physiological conditions or is a result of genetic abnormalities. Electron micrographs of a normal cell (a) and a cell undergoing necrotic cell death (b). Extensive distortion of the cytoplasm and the plasma membrane is evident. The scanning electron micrograph shown in c illustrates the marked lesions that appear on the surface of the plasma membrane at late stages of necrotic cell death. Adapted, with permission Purdue University Cytometry Laboratories; see also this review. Various cellular insults, including hyperactivation of ion channels such as the degenerin channels mentioned in the previous paragraph, expression of human beta-amyloid protein implicated in Alzheimer's disease, constitutive activation of certain G proteins and possibly the ageing process, can trigger a degenerative, necrotic-like cell death in Caenorhabditis elegans. This suggests that diverse initiating stimuli can induce a common death mechanism in injured cells. Elucidation of the molecular events that transpire during necrotic-like cell death in simple animal models should provide insight into the basic biology of inappropriate neuronal death and facilitate the characterization of mechanisms underlying degeneration in numerous human disorders. We are genetically and molecularly deciphering the Caenorhabditis elegans necrotic death program. Towards this end we have identified and are currently characterizing several novel genes that are required for necrotic cell death. Many diverse initiating conditions that trigger necrosis may provoke a net increase in the cytoplasmic calcium concentration, either by stimulating uptake of extracellular calcium or by facilitating the release of calcium stores from the endoplasmic reticulum. Calcium could, in turn, signal the mobilization of executioner cathepsin proteases and other hydrolases through calpain activation. Calpains have also been implicated in the activation of pro-apoptotic caspase proteases. See this review for a more extensive discussion. Since most Caenorhabditis elegans genes have counterparts in higher organisms and since the apoptotic cell death program has been conserved from nematodes to humans, it is highly likely that mechanisms of degenerative cell death are similarly conserved. In point of fact, we have shown that specific proteases are required for neurodegeneration in C. elegans which share extensive sequence similarity and are functionally equivalent to mammalian ones. 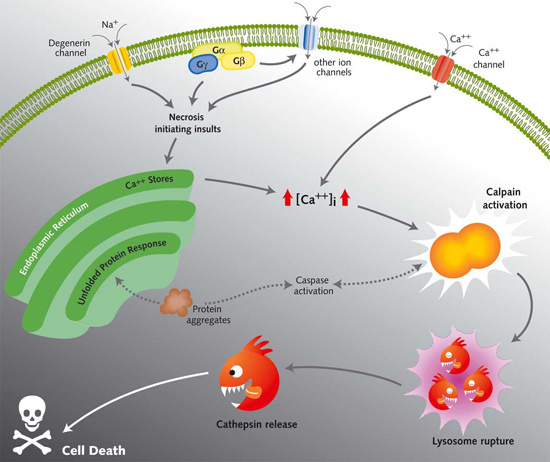 Calpains act sequentially with cathepsin aspartyl proteases, downstream of cytoplasmic calcium elevation to facilitate cell death. See this paper for more information. Thus, our efforts boast the important corollary of potentially providing new insights into brain injury and disease. For additional information see these papers (1 | 2 | 3 | 4 | 5), these relevant Press Releases (1 | 2 | 3), a commentary in the Journal of Cell Biology, a podcast by the Biotechnology Journal and some Press coverage bits: Der Spiegel, To Vima-Daily, Vima-Science, Alzforum, Eleftherotypia, Erevnontas, E&T, Patris (1 | 2 | 3 | 4), Nea Kriti.